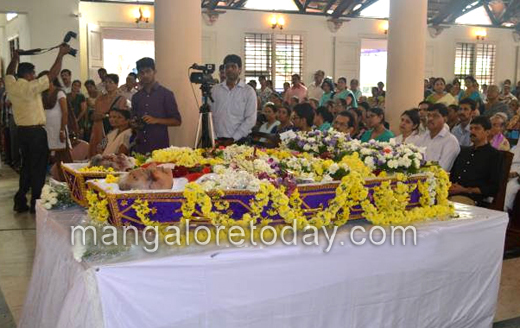 Mangaluru, Nov 3, 2015: A grief stricken mammoth gathering of Catholics and well wishers were seen this evening at Valencia Church and grave yard, where priests are generally interred to bid fare well to the two senior priests of Mangaluru diocese who served in an edifying manner at various locations in the the last more than 45 years (1967-2015). Emotions were visibly strong and sadness great among the huge crowd of thousands from all walks of life. Many community and political leaders too came to pay their last respects. The two retired priests of Vianny Home Kankanady, Rev. Maxim Furtado (74) and Rev. John D’Souza (73), who lost their lives on Nov 1, 2015 evening when their vehicle met with an accident at Kottara Chowki. The driver of the Bolero Rev. Joseph Martis, rector of St Joseph Seminary, Jeppu, driving the vehicle is in in hospital. 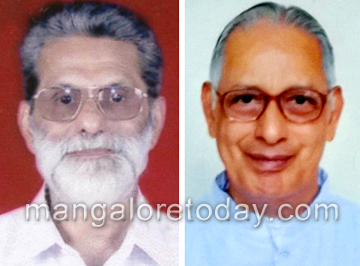 It is known that Rev Maxim E Furtado, from Madanthyar, born on November 19, 1941, and Rev John D’Souza born on April 22, 1942, were ordained on the same day, September 27, 1967, and as senior retired priets were living in retirement, they have served the community and region in exemplary ways. The concern and grief of the people of the city is palpable. The two priests would have had a close association for more than half a century. The funeral solemn mass was led by Rev Dr. Aloysius Paul D’Souza the Bishop of Mangalore along with Rev Dr. Gerald Lobo, Bishop of Udupi, assisted by nearly two hundred priests local and others. There was an out pouring of appreciation and gratitude to the two priests for their full length of services. They were in the process of settling in to another mission in their unhindered retired life at Kankanady in Mangalore. They were interred in the priests grave yard in front of Velencia Church amid honour, respect and deep sadness by clergy, leaders and people who had come from far and near in huge numbers.